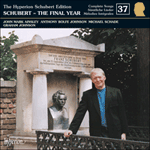 Schubert’s last song reminds us that the composer was himself a pianist who loved to accompany singers. The lilt (one may almost say ‘swing’) of the piano writing is exhilarating despite the fact the music neither stirs nor excites. It does, however, move in every sense. The marking is ‘Ziemlich langsam’, but like Liebesbotschaft, in the same key and with the same marking, the music is written two-in-the-bar (in this case alla breve). From this pull in opposite directions comes the humane compromise of which this composer is a master: a saunter of wellbeing and optimism moderated by a shadow of doubt – something gentle and wistful. And it is this Bewegung, so often to be found in the songs of the composer’s maturity, which is at the heart of many a Schubertian miracle. This is a song in the major key that should be happy – at least on paper. But like that similar masterpiece Frühlingsglaube, the singer’s radiant optimism only serves to remind the listener of the sadness that lies behind the bravery. The determination to believe that a milder spring is just around the corner is admirable, but the music tells us that this optimism is misplaced. The combination of self-delusion and gentle rapture engenders our compassion. Similarly, the lover too shy to woo with word and gesture, who sends forth his affection day after day in the form of mute and fluttering longing, is someone whose constancy we can admire, but only with tender concern for his real happiness. Like the nightingale in Wilde’s fairy story, there are those who press their hearts to the rose-thorn and sing with exultant happiness, and Schubert is one of them. Neither Frühlingsglaube nor Die Taubenpost makes any attempt to burden the listener with behind-the-scenes pain; on the contrary we might imagine that here is unalloyed joy until we read, or listen, between the lines. And then we are almost embarrassed to feel pity, so dignified and self-sufficient seem the bright-eyed singers of both songs. We know something they do not: that spring will never arrive, and that one day soon the pigeon will fade away on its homeward journey. How we know this is another Schubertian mystery, but we do, and it is somehow audible in the music. Thus Schubert seems to engage our pity without asking for it; and the radiance of the music draws us even closer to the hidden suffering. Most composers are masters of manipulation, of moving the listener by deploying myriad tricks of harmony and dramatic context. Schubert composed his fair share of music with a canny eye on audience response, and it would be wrong to cast him as a naïve innocent in this respect; he knew how to use musical techniques to conjure any effect (and reaction) he chose. But on many occasions, and often as a result of a poem which chimed with his own feelings, he withdraws into a world of his own where the listener is no longer to be delighted and persuaded, an observer on the periphery. It is at these times that Schubert writes songs without giving a thought to the effect they will make on the public. In the earlier years this sometimes led to lieder or ballads, over-long and little suited to the recital platform, which only Schubertians can love (and love them we do). But at other times, and especially as he got older, the composer seems to have been able, from time to time, to confide something to manuscript paper that is so artlessly true, so unaffectedly vulnerable, that we, like the carrier-pigeon, find ourselves peeping into the window of a beloved soul. The great cycles are not of this ilk – they are too important to have been written while lost in dreamy confessional mode. (It is true that Schubert was far ahead of his listeners’ tastes in Winterreise, but that does not mean that he did not envisage the winter traveller recounting his pain to the world.) Smaller songs, like diary entries rather than novels, are another matter, and Die Taubenpost, written in the wake of the great Heine songs, continues the An die ferne Geliebte mood of the other Schwanengesang songs with an important difference. The characters in that collection (whether warrior or weightlifter, serenader or haunted lover) are little to do with Schubert himself; they invoke the shade of Beethoven, the muse of Heine, and so on. 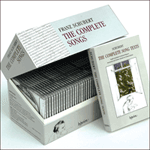 But Die Taubenpost is one of those transparent songs which speak in the composer’s own private voice. 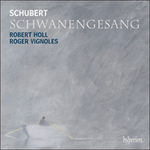 The effect of this in a performance of the cycle as a whole is suddenly to re-introduce the voice of Schubert himself; he comes before the curtain to speak the envoi which brings the work to a close. There is even a small possibility that he told the publisher Haslinger in person that he wanted a fourteen-song cycle (‘to be dedicated to his friends’ as Spaun says) rather than an unlucky thirteen. It also fitted in exactly with the linking ‘theme’ of a homage to the ‘ferne Geliebte’. But it is much more likely that it was Haslinger himself who added the song to the set at the time of publication in May 1829. It had already made an impression in a Schubertiad in January of that year when Vogl had sung a number of songs in memory of the deceased. What had made Schubert read these words, and lose himself in them, is perhaps not difficult to imagine. It is said that he remained, until the end, hopelessly in love with Countess Karoline Esterhazy to whom, he said, all of his works were dedicated without him needing to say so. Apart from these, what could he send her? Letters with ardent declarations of love? Certainly not, for this was almost certainly a one-sided passion where all the constraints of a difference in social station forbade even a formal expression of romantic admiration. In any case the composer seems to have been as in love with what Karoline represented – musicality, sensitivity, an irreproachable womanliness to complement his longed-for, masculine (Beethovenian) independence – as much as for the person she actually was. Fate, which thrust this precious vessel of grace defenceless into the world, gave him the capacity to rejoice, and this it was that made him rich. From his wealth he drew the love that lives within his melodies, the love he never received and always so lavishly poured forth. Die Taubenpost happens to be Schubert’s last song, but it is not this which makes it so moving. We would have been moved at any time by a song which drew attention, unintentionally and in enchanting metaphor, to the gap between what Schubert gave, and the little he received back. It is true that such an evaluation turned out to be timely, and is, as it happens, a fitting (and wonderfully elegant) farewell. But Schubert’s breezy willingness to carry on sending the pigeon flying on its thankless missions is a sign that he himself wrote this song in no valedictory sense. We catch him not at a tragic moment, surely, but at a crossroads of what may nearly pass for contentment. Things were going well, give or take, as always, a few setbacks. He had laid claim with a succession of important works to Beethoven’s mantle, and the cloakroom attendant at the Musikverein was surely on the point of handing it over to his safekeeping. He was composing ‘like a god’ (to use his own words after a good patch in 1818) and, if only he could get over this patch of illness and return to Schober’s house, he would be able to begin to reap the rewards of all the hard work of 1828. Die Taubenpost is really, thus, a song by someone who accepts the status quo with a smile and a rueful sigh. To be in love with love, to have a guiding star, however distant, is better than to be gloomy and cynical. And thus there is a lift to the music from the very first bars. The four-bar introduction is a masterly essay in how an unremarkable sequence of chords, switching between tonic and dominant, can be turned into magic. The sparing use of root-position chords is part of the secret, as is a wonderful use of syncopation: each bar kicks off with a jaunty note in the bass and on the beat; the right hand follows a quaver later off the beat, the music lightened by the bounce of chords not merely marked staccato, but staccatissimo. (The reason why the song is syncopated at all becomes clearer later.) The left hand, almost in the manner of honky-tonk jazz pianism, leaps many a cheeky tenth. The pianist is usually afraid of those sudden forays into the bass register, but if he remains relaxed the gambol pays off. In the right hand there is no sign of conventional melody; but the vamping chords constitute as memorable a pattern of notes as could be desired. Once again, here is the Schubertian sleight-of-hand where melody is accompaniment, and accompaniment melody. The undated sketch of this song (with bare vocal line and various accompanying figures added in aide mémoire fashion) reveals that the composer had initially had the voice (at ‘Ich hab’) begin on the tonic, two Gs. These were later changed to Bs, and what a masterstroke this was. The first sounds grounded and ordinary, the second already on the wing. The vocal line is set partially in dactylic rhythm, a logical outcome of Schubert’s linking of this pulse with the workings of nature – the attraction and desire felt by the narrator, routine and instinct on the pigeon’s part. Underneath the first sentence the piano has a syncopated phrase, derived from the introduction but with an important embellishment (off-beat crotchet + quaver + a lilting three-note motif: dotted quaver + semiquaver + quaver). This is an important part of the accompaniment for verses 1, 4 and 5 of the music, when the pigeon is at home and not on one of its journeys. In this figure Schubert, like some nineteenth-century Messiaen, has transcribed the song of the wood-pigeon whose off-beat ‘signature tune’ in the wild is also syncopated, and also ends with a similar little roulade. (I am grateful to my colleague Simon Keenlyside, an expert ornithologist who, when I first suspected this link, sang me various pigeon songs over the phone from Salzburg.) Thus it seems it is birdsong which has inspired the entire Bewegung (unique in Schubert’s lieder) of Die Taubenpost; even the alternation of legato chords with staccatissimo in the introduction makes better sense when heard as a sound bite of outdoor life. This is, after all, the same composer who built the sounds of the cricket into his music – Der Einsame – as well as that of the quail (Der Wachtelschlag … also set by Beethoven of course). This has not begun as a song rich in modulation, but this is perhaps because the carrier-pigeon is still safely grounded at home and cooing away for most of the first verse. At ‘Und fliegt auch nie vorbei’ (‘and never flies too far’) there is a shift to the chord of B major (the dominant of the relative minor) for the first of numerous enchanting interludes. Schubert uses two of Seidl’s verses to make one musical verse. Thus ‘Ich sende sie viel tausendmal’ begins the second half of the ongoing, seamless melody which has taken possession of the song almost without our noticing. The inevitability of the rise and fall of this unfolding tune is sheer Schubertian delight. The first ‘bis zu der Liebsten Haus’ shifts into the relative minor of the home key, but then, led by a downward flight of winged semiquavers in the piano (another enchanting accompanying motif which recurs four times in the course of the song), the repeat of these words leads back to the tonic. A five-bar interlude, based partially on familiar motifs in the accompaniment, and partly on the melodic line, leads to the song’s second verse (Seidl’s third and fourth). How marvellously the pedal on D for eight bars conveys that the pigeon is transfixed at the lover’s window, and as curious as a peeping tomtit! The pianist’s finger keeps returning to D in the left hand, as if retaining a precarious grip on the windowsill. The sudden shift from D major into B flat major at ‘Kein Briefchen brauch’ ich zu schreiben mehr’ sounds both grateful and loving. The following four lines of poetry remain in this key, and we note the return of the dotted rhythm cooing motif – something which the composer uses in this song to signal the bird’s safe return to home base. But the music itself only returns to the tonic after another five-bar interlude, perhaps the most wonderful of the various piano links in the piece. The way that Schubert engineers the modulation from B flat major to G major in this Zwischenspiel is breathtaking in its elegance (it almost seems obvious, but only Schubert could have accomplished it in this way, and only after hard work – this much the sketch reveals). The song is a study not so much in harmonic adventurousness as in the subtle permutations of harmony which stem from various inversions of the chords of the tonic, subdominant, and dominant. The strophic element of the song now comes into its own. Seidl’s verses 5 and 6 are set to more or less the same music as his verses 1 and 2, everything fitting to perfection in terms of accentuation and meaning. But this structure in pairs leaves one verse over in a poem of seven stanzas, and this Schubert sets as his coda. In the home straits of his entire songwriting career, and in the process of saying farewell without knowing it, he writes a final page of such ravishing beauty that it is difficult to think how any conscious valediction could have been more eloquent. It is the yearning of this page, and its sadness with a gentle smile, that has made so many people imagine that Schubert knew the time had come to say goodbye. At first we think that this will be a repeat of the music for the poet’s verses 3 and 4, but we soon realise that Schubert the magician is at work. Once again the sketch shows how he changed and refined his original thoughts to achieve the optimum effect. Harmonic change now engineers a more urgent note. ‘Drum heg’ ich sie auch so treu in der Brust’ leads to a modulation into the intimate regions of the subdominant (C major) at ‘Versichert des schönsten Gewinns’. From here to A major for ‘Sie heisst – die Sehnsucht!’ is a short journey but an unexpected one with a built-in hesitation, the apotheosis of the Schubertian hiatus, that points towards a new turning and a shaft of light at the end of the tunnel. The appoggiatura lean on ‘die Sehnsucht’ in this context (and when we hear it later on a different accented passing-note) is quite simply the most touching setting of this key word in the entire song repertoire. ‘Kennt ihr sie?’ (we hear this twice) might have come from the lips of Goethe’s Mignon in Kennst du das Land, so searching and vulnerable is the gaze behind the question. The music seems to scan the face of the person to whom the question is addressed (‘Do you know it … do you? … please tell me!’). ‘Die Botin treuen Sinns’ is full of the greatest tenderness, as well as pride. These birds are the narrator’s very life and love. And then the words over again, but this time ‘schönsten Gewinns’ leads us into E flat rather than C major. As if suspended in mid-flight, the piano remains suspended in this tonality for two bars. This time ‘Sie heisst … die Sehnsucht’ (the gap between the phrases both signifies and causes a lump in the throat) returns the music to the tonic key – an inadequate description of a musical miracle that is both unexpected and inevitable. In this passage we hear Schubert’s own longing soft and clear; what it has cost him to do without reciprocal love for so many years; how a young man, tormented and fatally wounded by sexual temptation, has lost neither his capacity for tenderness, nor the romantic idealism that has remained, despite everything, a source of hope and joy. The remaining music, including the beautiful postlude, is fashioned from what has gone before. This blend of happiness and wistfulness sets the seal, gently and without ceremony, on a composer’s entire songwriting career, indeed his entire creative life. That Haslinger felt that Die Taubenpost deserved to be rescued from its orphan status, and to become a part of Schubert’s last published song-cycle, is more than a money-making ploy. It shows an understanding of the inner, private Schubert unique in the hard world of music publishing (compare Probst’s insensitivities, as well as Diabelli’s). The termination of their collaboration is one of the tragic losses of November 1828. This poem never appeared in print in Schubert’s lifetime. It must have come his way, like the texts of the Refrainlieder, from the poet himself. The poem was printed in Volume 4 of Seidl’s Schriften (1879). Sie heisst – die Sehnsucht! Kennt ihr sie? her name is – Longing! Do you know her? A whole book could be written about Schubert’s relationship to the third degree of the scale, and his fondness for key-shifts through the same interval—think of the heart-stopping descent from B to G major that occurs in Nacht und Träume—and it can be no accident that the lilting melody of Die Taubenpost revolves around the third of the scale. Indeed, Schubert himself seems to make the point at the end of the second couplet, when he harmonizes the word ‘vorbei’ in B major rather than the tonic G major (original keys). Repeatedly both piano and voice return to this note; only at the very last cadence of each verse does either fall to the tonic. On pourrait consacrer tout un livre à la relation que ce compositeur entretenait avec le troisième degré de la gamme, à sa tendresse pour les transitions tonales dans cet intervalle—songez à la tombée de si à sol majeur qui survient, à vous arrêter le cœur, dans Nacht und Träume—et ce n’est certainement pas un hasard si l’allante mélodie de Die Taubenpost tourne autour de ce degré-là. Ce que Schubert lui-même semble faire remarquer à la fin du deuxième couplet, lorsqu’il harmonise le mot «vorbei» en si majeur et non en sol majeur de tonique (tonalités originales). Voix et piano reviennent souvent à cette note et il faut attendre l’ultime cadence de chaque strophe pour que l’une et l’autre retombent à la tonique. Über Schuberts Beziehung zur dritten Stufe der Tonleiter und seine Vorliebe für Tonartenverschiebungen um dieses Intervall ließe sich ein ganzes Buch schreiben—man denke nur an den atemberaubenden Abstieg von H nach G-Dur in Nacht und Träume—und es dürfte kein Zufall sein, dass die trällernde Melodie von Die Taubenpost sich um die dritte Stufe der Tonleiter dreht. Schubert selbst scheint dies sogar am Ende des zweiten Couplets hervorzuheben, wenn er das Wort „vorbei“ mit H-Dur statt der Tonika G-Dur harmonisiert (Originaltonarten). Sowohl Klavier als auch Singstimme kehren wiederholt zu dieser Note zurück und erst in der allerletzten Kadenz jeder Strophe fällt das eine oder die andere auf den Grundton.